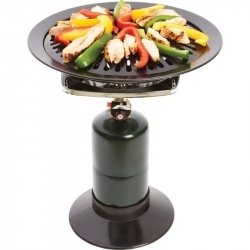 Features a cylinder to hold a whole chicken and a round tray with handles for steaming vegetables on a BBQ grill. Cylinder can also hold a beer can to make beer can chicken. Measures 12' in diameter x 3-3/4'. Limited lifetime warranty. Gift boxed. Award winning BBQ depends on exceptional equipment as much as a great rub. 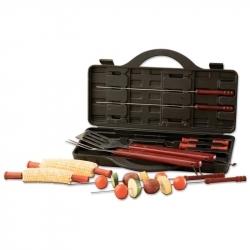 The Mossberg(TM) 21pc Stainless Steel BBQ Set includes a 14' Turner, 13-3/4' Fork, 13-1/2' Premium Tongs, 8 Skewers, 8 Corn Holders, and 2 Premium ABS Meat Claws. A magnetic storage box with foam insert will keep this premium set in place and protected in between weekend grilling dates. Gift box. 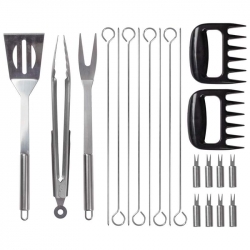 Set includes: meat fork, slotted spatula, and tongs. Utensils feature bamboo handles and come in a zippered storage bag measuring 14-1/2' x 4-3/4' x 2'. Limited 5 year warranty. $35.25 Open Stock Value. Gift boxed. 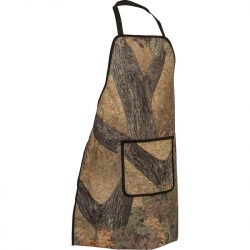 Features invisible tree camo, 1 front pocket, and polyester lining. One size fits most. The Meyerco(R) Barbeque Grill can be used camping, at the tail gate party, or at the weekend backyard cookout. 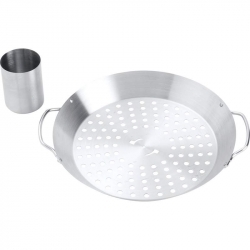 Features a high-quality nonstick surface for easy cleanup, and a water-filled outer ring to catch fat and juices during cooking - no more smoke or hot grease splattering. The 12-3/8' grill with iron plate works on standard electric, gas or propane stoves. Stove and propane tank not included. Limited 2 year warranty. Gift boxed. 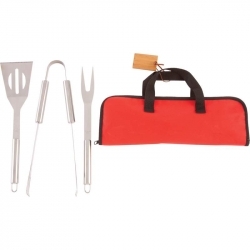 Set includes: meat fork, slotted spatula, and tongs. Utensils feature stainless steel tube handles and come in a zippered storage bag measuring 14-1/2' x 4-3/4' x 2'. Limited 5 year warranty. $50.85 Open Stock Value. Gift boxed. Grilling is a breeze when you have the cooking right tools and a place to store them. 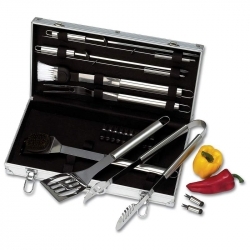 The Chefmaster(TM) 22pc Stainless Steel Barbeque Tool Set equips you with 22 pieces of quality stainless steel grill equipment. 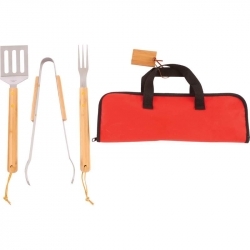 Set includes tongs, spatula, fork, basting brush, grill brush, 12 corncob holders, and 4 skewers. Individual pieces have a $118.50 open stock value. All packed in an aluminum storage case measuring 18-5/8' x 10' x 3-1/8'. Limited lifetime warranty. Gift boxed. Includes spatula, fork, 4 skewers and 8 corncob holders. All come stored in a carrying case measuring 16-1/8' x 8-3/4' x 2-1/4'. Limited lifetime warranty. $43.97 Open Stock Value. Color sleeve.